Bold Eagle winning yesterday’s race in Paris. 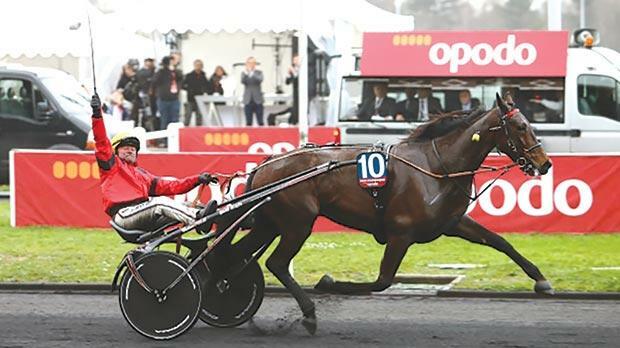 Bold Eagle, a five-year-old French trotter, won the 95th running of the renowned Grand Prix d’Amerique international trotting race at the Vincennes Racetrack, yesterday. Driven by young Frenchman Franck Nivard, Bold Eagle raced to an impressive victory as 18 horses lined up for the challenge over a long distance of 2,700 metres and staged in front of 40,000 spectators. Bold Eagle surged to the front from the start and never relented its pace. It opened a half-length’s lead from Timoko (Bjorn Goop) and Up And Quick (Jean Michel Bazire), the 2015 race winner. Bold Eagle went unchallenged for the rest of the race, going past the post first and more than a length ahead of Timoko as Italian Oasis Bi (Pierre Vercuysse) raced up to third place ahead of Akim Du Cap Vert (Franck Anne). Bold Eagle’s average time was 1.11.4” per kilometre – a new record time for the race. Victory was Nivard’s fourth in the Prix d’Amerique, an event considered by many as the World Cup in trotting racing. Nivard won the race twice with Ready Cash which happens to be Bold Eagle’s sire. Bold Eagle, trained by Sebastien Guarato and owned by Pierre Pilarski, is the 15th horse in history to win the Prix D’Amerique at the age of five years or younger.